1:25 p.m. – Kick off your Saturday with Parquet Courts, Spin magazine’s Band of 2014. The New York band evokes some of the best parts of city’s rock history, channeling the likes of Television and other CBGB icons. 2:20 – Fans of Alabama Shakes should definitely catch the seven-piece soul band St. Paul & The Broken Bones, who also hail from Alabama. The two bands even share a producer, but they’re no copycats; Paul Janeway’s rich voice holds its own, as do his moves as a frontman. Check them out in Mojave for yourself. 3:00 – Royal Blood, the best UK rock export since Muse, make their Coachella debut on the Outdoor Stage. Get to know the band better by reading our chat with them backstage at KROQ’s Christmas bash, and catch them on tour with the Foo Fighters this fall. 5:35 – The last time we sat down with Royal Blood, band members Mike Kerr and Ben Thatcher sang the praises of Jungle, a fellow Mercury Prize nominee described as a “modern soul collective.” Catch Jungle’s impressive live act at the Mojave Stage. 6:40 – Even with nine albums and nearly 20 years as a band, Belle & Sebastian’s music is as confident, pure and bright as it has ever been. If their KCRW session earlier this year was any indication, the Glaswegian band is also having the time of their lives on stage with their new album, Girls in Peacetime Want to Dance, and it’s infectious. See them at the Outdoor Theatre. 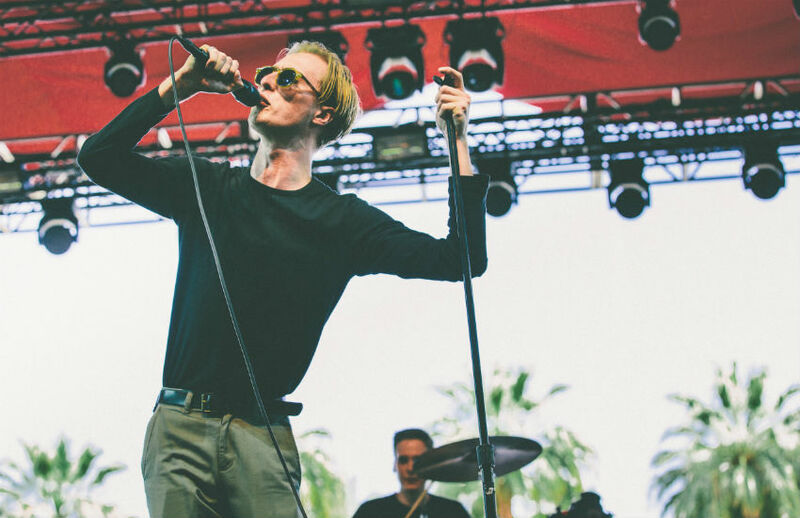 7:30 – It’s an eclectic evening: Move from the earnest charm of Belle & Sebastian to the experimental rock of Alt-J on the Coachella Stage, where they’ll play tracks from their new record, This Is All Yours. This record is perhaps even better than their debut, which won the Mercury Prize. 8:00 – Sneak out of Alt-J a little early to watch Father John Misty. In February, former Fleet Foxes drummer J. Tillman released his second solo album as Father John Misty to near universal praise. He’ll bring his stunning psychedelic folk to the Outdoor Theatre. 9:15 – Say what you will about him, but Tyler the Creator is a force of nature. The Odd Future leader is a rapper, writer, producer, visual artist, clothing designer, graphic artist, and actor who consistently pushes the envelope with his lyrical content, live performances and visual media. Expect the unexpected before departing to catch FKA Twigs at 9:35 in the Gobi tent. 9:15-11:00 – If rap isn’t your thing, you hardly need much motivation to catch Jack White on the main stage. The ubiquitous rocker is supporting his most recent album Lazaretto, but expect imaginative reworkings of his impressive catalog.